Brushing your teeth is one of the best preventative measures you can take to keep your mouth healthy. According to the American Dental Association (ADA), both electric and manual toothbrushes are effective at removing plaque that causes tooth decay and gum disease. The question is, which one is better for you? Manual toothbrushes come in different styles, bristles, heads, and colors to choose from. If you have sensitive gums, you'll find soft bristles to meet your needs. If you have a smaller mouth, you'll find smaller heads. Manual toothbrushes are less expensive than electric ones, and you will not have to replace any batteries or charge your toothbrush. It’s much easier to travel with a manual toothbrush and to replace it when needed. Manual toothbrushes exert less pressure on your gums and teeth. Electric toothbrushes subject your teeth and gums to more pressure which may cause tooth sensitivity. Electric toothbrushes have bristles that vibrate or rotate to help remove plaque buildup from your teeth and gums. The vibration results in more micro-movements when you move your toothbrush across your teeth. The rotating and oscillating bristle heads can effectively clean any trouble or hard to reach spots. A built-in timer can help you brush your teeth long enough to remove plaque from your gums and teeth effectively. Electric toothbrushes are easy to use. All you need to do is place the toothbrush at a 45° angle, and just let the toothbrush do all the work. Electric toothbrushes are helpful for people with limited mobility, or those with developmental disabilities. They are also useful for people with orthodontic appliances such as braces because they make brushing easier. Children find electric toothbrushes more fun to use. They are less work than manual toothbrushes, they tickle their teeth, and the timer will let the child know when brushing is done. Brushing teeth is easier and more exciting for kids with electric toothbrushes. Regardless of the type of toothbrush you choose, a clean and healthy mouth depends on proper brushing techniques. Both kinds of toothbrushes are effective if you brush for two minutes twice a day, but electric toothbrushes have a slight edge. Studies have shown that, in general, electric toothbrushes work to remove more plaque than manual toothbrushes, which reduces the risk of developing cavities and gum disease. 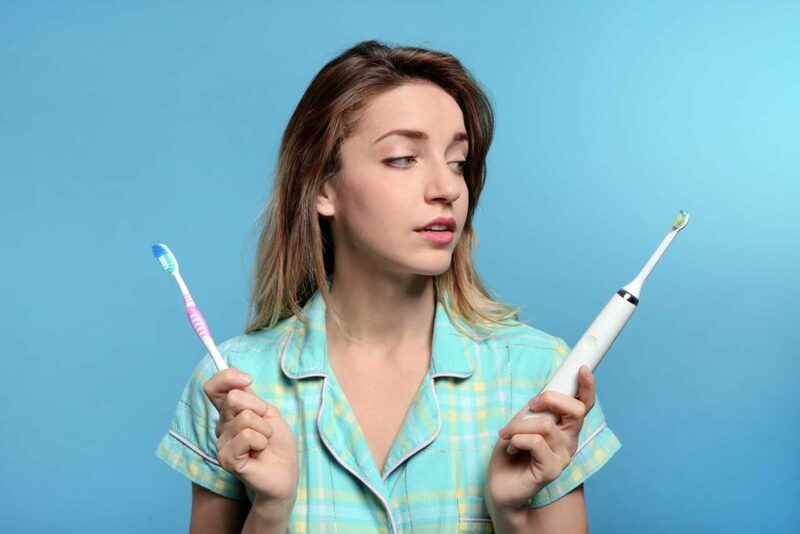 Whether you use a manual or electric toothbrush, make sure to avoid excessive brushing which can abrade the tooth enamel or the roots if you have gum recession. Abrasion can result in sensitivity to heat and cold. Contact Dr. Rick Dentistry to learn more about keeping your mouth clean and healthy. We will work with you to help you determine the best toothbrush for your specific needs. We believe in the importance of preventive practices to lower your risk of developing dental problems down the road. We are all about helping you enjoy a healthy smile for a lifetime!